But no matter how insightful an opinion might be, every firm has one. So touting and promoting those opinions out into the marketplace can just as often contribute to the noise, rather than truly demonstrating leadership. 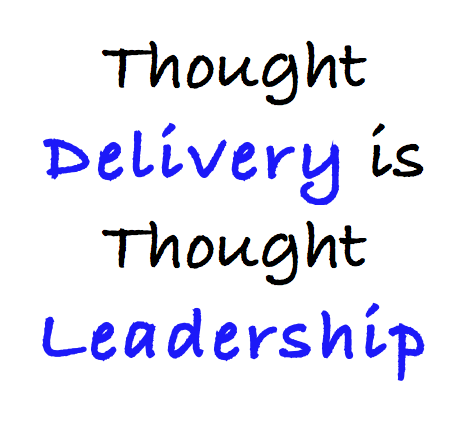 So what is true “thought leadership”? And who has it? When working with a well-qualified manager, state of the art thinking should be expected. While the thought process should be rigorous, the conclusions do not have to be novel or different from everyone else. (Remember, the correct answer is not always outside the box—sometimes it can be right there in the box, where no one thought to look for it!) So if every qualified manager is publishing thoughtful research, is that truly thought leadership? No. Leadership is demonstrated by how that thinking is delivered and applied. Imagine that you are sick—seriously ill. Wouldn’t you want to see the best doctors? Would you select your physicians because they have a novel view of physiology or pathology? Not likely. First, you would want to start out by identifying the qualifications that are relevant to your situation. You would want the best doctor from among that group. But who would that be? Who gets the best results for their patients? Being qualified is a prerequisite, but it doesn’t mean being the best or getting the best results. The doctors who get the best results for their patients are the doctors who are not only qualified but who also have really strong diagnostic skills to understand the affliction as well as the patient. To quote Sir William Osler (physician and professor often referred to as the founder of modern medicine), “If all patients were the same, medicine would be a science, not an art.” (Quoted in Harvard Business Review, October 2007.) A good diagnostician will know the right questions and how to integrate the patient’s answers, history and facts with their own knowledge and experience before writing a prescription or suggesting a course of action. There is no one correct way to manage a municipal bond portfolio, but there are many ways to do it badly. Because no two investors are alike, there is no single correct way to manage a municipal bond portfolio. What is appropriate for one investor may be inappropriate for another. In addition, as the markets move and your situation changes, what may have been appropriate for you in the past may no longer be. Consequently, building a municipal bond portfolio requires an understanding of the markets, the securities and the investor—and not necessarily in that order. Thought Leadership consists of rigorously formed opinions, articulated and delivered in a way that the client understands. So is thought leadership important? Yes—access to expertise is crucial for investors. And if asset managers are doing a good job of delivering their expertise and opinions in ways that make sense to investors, it is possible that 2/3’rds of them can be considered thought leaders. Work with advisors and brokers who have the appropriate qualifications and experience and who actively demonstrate their interest in helping you understand “what it means to me.” As with the best physicians, you will recognize this in the diagnostic process—how well do they get to know you and your goals by asking good questions and listening carefully to your answers? If you feel like your doctor is rushing to fill out a prescription, you would rightly feel uncomfortable. So it should be with your financial services providers—if you feel rushed to select a “prescribed” product, stop and ask more questions. The changes in the economy and the markets over the last 6 years have made investing more “interesting” than ever. The need for advice and guidance—for thought leadership—is going up, not down. But if investors don’t hear your ideas, are they really good ideas? Asset managers seeking to be Thought Leaders should work to ensure the best delivery of their insights by making it easy for investors and intermediaries (such as brokers and investment advisors) to understand and re-deliver those insights to the appropriate clients and prospects. Much of the research and marketing content created by the industry is delivered B2B – Business-to-Business; effectively leaving it up to the broker or financial advisor to convert it into insights that the client will understand. Speaking as market professionals to market professionals is appropriate, but try to also have a parallel B2B4C mindset (that’s my term) – Business-to-Business-for-Clients. Provide research and opinions in ways that make it easier for the intermediaries to deliver them to their individual clients—because thought leadership is thought delivery. Contact me if you need help in fine-tuning your Thought Delivery. * As reported by The Boston Consulting Group for their Global Asset Management 2015 report, Sparking Growth With Go-To-Market Excellence. See Exhibit 9 on page 17, and note that 64% of the firms surveyed describe their thought leadership capabilities as “well developed” (42%) or “Advanced” (22%). The information is based on a detailed survey of 135 leading asset managers, representing $39 trillion, or 53% of global assets under management. The report makes for very interesting reading for anyone involved in the asset management industry. **UBS Financial Services Inc., Municipal Insight, December 2003. Please sign up to receive e-mail updates from Income Investor Perspectives. The objective here is not to replace or repeat the numerous and excellent forecasts, market commentaries and research opinions that are available, but to offer context to help filter out some of the noise that can obscure the risks in the marketplace. Helping income investors and advisors understand and navigate the markets.